Plumbing is something we all take for granted until there is a problem. Marketing a plumbing business, it can be hard to drum up new leads. But, that does not mean you have to wait for potential clients to call you. As the #1 ranked SEO Expert on Google, I have personally worked with many plumbing contractors and companies to attract new leads and clients. I have experience in both residential and commercial contractors. Quality plumber marketing will set your business up for success. The reality is that marketing online and off is a challenge. 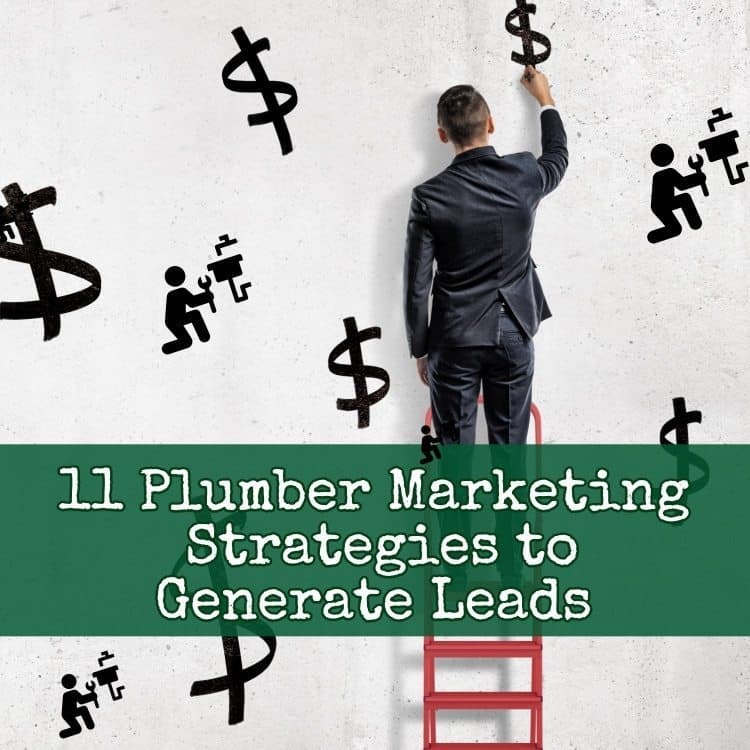 With that in mind, here are 17 lead generating plumber marketing strategies to help you grow your business in 2019 and beyond. How to generate plumbing leads? The first thing every plumbing company should think about is their local search engine optimization. Without a doubt, this is the best way to get plumbing leads. Specifically, local search something that will help you build an online presence. Local SEO will help you connect with the people who are likely to use your services. Like all SEO, this breaks down into two categories. The first is on-site optimization, the things you do to make your plumbing website easy for Google to navigate and rank. You will need to optimize for local keywords. Then, you will want to use them in key places on your site. Examples include URLs, title tags, and image tags. On-site should also include a review of your site. Every aspect of your website should work to create a positive experience for users. Google notices these things, and they can make a difference in your search rankings. Off-site search engine optimization is mostly about building quality backlinks. You need reputable sites linking to your site. It is not a good idea to buy links. The best links are built organically. That is something a Plumbing Marketing expert can help you to do. The other element of off-site optimization for the search engines is managing your citations. Any time your plumbing company is listed in a directory or social media, the listing should be the same. If you use Ave instead of Avenue, do it in every listing. If you do not already have an email list in your plumbing business plan, you need to ask yourself why. Email is one of the most effective marketing tools out there. It is also one of the least expensive. In fact, marketing emails earn an average of $40 for each one dollar spent. Email addresses are gold for plumbers! That is a massive ROI in email marketing for plumbing companies. You may have been collecting client emails without doing anything with them. If that is the case, you can send out a preliminary email. Ask clients to confirm a subscription to your list. Then, you can add a subscription option to your website. You may want to consider a double opt-in. That is the best way to avoid the spam filter. After a customer opts in, you will send them an email. They will have to click on a link to confirm their subscription. Once people subscribe, you can put your email list to work. If people hear from you regularly, they will think of you when they need a plumber. That might be the most significant plus of having an active email list. Even a home built in the past five years can have plumbing issues. However, you and I both know that older homes are more likely to have problems. You can use your knowledge of plumbing to narrow your audience. A straightforward way to do that is to leverage the data on sites like Zillow. Real estate sites often list the year a home was built. This is not the easiest marketing method. However, done correctly, you can use it to locate potential customers and areas to target. For example, you might identify older homes in your area. Then, you can target those homeowners with a direct mailing campaign or Facebook ads designated to that specific zip code. Even if they do not need your services, they may keep your mailer. Then, when something goes wrong, they may call you. You could also try some door-to-door canvassing or cold calling. This is not for everybody. It is a way to integrate online marketing with old-school techniques. You probably have a website for your plumbing business. What you may not have is a website that is designed to generate leads. A conversion-based website is one where each element helps you attract new customers. Your site should be optimized for local keywords. Ideally, your location will be part of your URL so that it is clear which areas you service. Each page of your site should be optimized for your chosen keywords. That means using the appropriate tags and putting your keywords in prime locations. A keyword in the H1 tag carries more weight than one in the text. Here are some other things to help turn your website into a lead generator. If you don’t already have one, start a plumbers blog. Write a new article at least once a week about a relevant topic. Such as how to plumbing repairs. Use unique images and make sure to use keywords in the alt tags and captions. Add videos to your website. Cross post them on YouTube and social media. Seek out high-quality backlinks. Link to authority sites as well. Ensure your website design is fast and mobile friendly. Your landing page should have a clear call to action, with an easy to find a phone number. Collect email addresses with a simple opt-in form. These simple changes can add up to a host of new customers. To overcome this lack of trust, include testimonials from LOCAL past customers who are happy with the services you provided. This step can make a huge difference in the number of people who enter their payment information to complete the order. On a related note, try using Facebook’s rich data to target potential clients. Nobody wants to have to call a plumbing company. But, you want people in the area to know who you are. That way, if something goes wrong, they will be likely to contact you. You can use your email list to create a custom audience. You can use your email list to create a lookalike audience. You can create an audience based on the data Facebook provides. That includes both demographics and psychographics. That is a simple illustration, but it shows what you can do with Facebook. The data available makes it possible to fine-tune your message. That way, your ads will be seen only by people who are likely clients. Since Facebook uses pay-per-click, you will only pay for people who engage with your ad. Also, use the Facebook pixel for retargeting. You can target potential clients directly on Facebook who have already visited your site. Here, I am talking about people who’ve visited your plumbing site without contacting you. The Facebook pixel is a tiny snippet of code. You can get a unique code for your site from your Facebook business page. You will need to copy it into the header of each page of your website. There’s a complete set of instructions here. Once it is installed, you will tell it what to track. The tracking is based on user behavior. You might target people who started to fill out your contact form. Or, you might pursue people who viewed a service page. You will create a Facebook advertisement designed to appeal to your chosen audience. The people you target will see your ad on Facebook. Because they are already familiar with your brand, there’s a high chance that they will click. Studies have shown it takes from 4-10 “touches” for a customer to hire a home service. I like it because this kind of retargeting is useful. Remember, brand familiarity is a big part of lead generation. Blogging might seem as old-fashioned as an online digital marketing strategy. But, it is still one of the least expensive ways to connect with potential clients. Why? For one, Google lists content as one of its three most important ranking factors. It is second only to backlinks. Download my list of over 500+ plumbing blog ideas here. Don’t just take Google’s word for it. Independent research shows that 60% of consumers have made a purchase after reading a blog. Content marketing is here to stay. As a digital marketing expert, I can tell you that regular blogging will bring organic traffic to your site. What should you blog about? The short answer is anything that’s relevant to your target audience. The need for regular plumbing maintenance by a licensed contractor. In other words, the primary criteria are that your blog is attractive to your site’s visitors. The specific topic does not matter as much as your blog’s relevance. You might be wondering how long your content should be. A reasonable minimum length for blog posts is 800-1000 words. But, longer content, if it is well written, will keep people on your site. That is a metric that matters to Google. They want to see that people who come to your site are staying for a while. My best tip to keep people engaged on your site include a video. Hopefully, you have already claimed your GMB page. If you have not, you should do it right now. 80% of all consumers look for local business online. Don’t be one of the 44% of businesses who have not claimed their listing. An optimized GMB listing can do a lot to help you attract leads. Is your listing already optimized? Even so, you may not be aware of GMB’s updated features. Some of these are entirely new. They are designed to help you generate leads. Here’s a quick rundown of some of my favorites. Appointment URLs make it simple for customers to schedule an appointment to see you. Instead of calling, this feature lets them book right from GMB. The direct messaging feature lets leads contact you from your GMB or Google My Business page. You can program automatic responses if you want. You can also turn messaging off when you are unavailable. The questions and answers section can save you time. It is a space where you can answer questions you get repeatedly. Think of it as an off-site FAQ for potential leads. There are other new features as well. Using them can help you connect on GMB. Referrals are like free plumbing advertising. There are plenty of good reasons to set up a referral program. Paying for plumbing leads can flat out get expensive. Most importantly, leads from referrals convert 30% more often than other leads. That is nothing to sneeze at. Remember that referrals are usually free. You will have to spend a bit of time and effort to set up a program. Once it is in place though, you will get referrals on an ongoing basis. I recommend addressing referrals in two ways. The first is to make a habit of asking clients for referrals. When you finish a job, give the client a stack of business cards. Tell them that you would appreciate it if they would refer their friends to you. You can also encourage referrals by asking for them on social media. That is another low-cost way to drum up business. The kind of referral program that’s most beneficial for plumbing companies is a mutual referral program. If you have a local hardware store, stop in and talk to the owner or manager. See if you can give a presentation to the salespeople. Ask them to refer customers to you. Then, agree to refer your clients to them. Even if your only home supply store is a big chain like Lowe’s, this can work. You might have to work a bit harder to get your foot in the door, but persistence will pay off. If you can get a referral program set up, it can provide a steady stream of clients for years to come. Reviews matter to every local business. According to consumer research group Bright Local, 97% of consumers read online reviews in 2019. 86% said they trusted online reviews as much as personal recommendations from their friends. A few sites to consider include Yelp, Angie’s List, and Home Advisor. In most cases, you will have to verify that you are the business owner. Once you have claimed your listing, you can update it. Make sure that everything is accurate. Check your business hours, prices, contact information, and website. Adding high-quality pictures will round out your profile. To make sure you do not miss any sites, do a Google search for reviews of your plumbing company. You do not have to have claimed a listing for there to be reviewed there. If there are negative reviews, don’t panic. Respond politely and encourage the reviewer to contact you privately. Going forward, make sure to monitor reviews. Did you know that consumers are more likely to share negative experiences than positive ones? You might even recognize this behavior because you have done it. We like to have our bad experiences validated. The problem with that is that we do not talk about positive experiences. Your plumbing clients are less likely to write a review when they are happy. You can see the dilemma that poses. You need good reviews! Reviews are one of the top 3 ranking local factors. The way to get them is to ask. You should not assume that clients will write them. Instead, work out a system where you ask automatically. Create a rough template for reviews. Then, email it to your list and ask past clients to write a review. Creating a template lets them know what to include. Some people are not sure. Giving some guidance makes it more likely they will do what you ask. You do not want to overdo it asking for reviews. If you send an email, wait to follow up. Make sure to check if the client has left a review before asking again. Social media marketing is more popular than ever. 10-30% of your plumbing service leads should come from social media. Setting up social media pages is free. The trick is to use your accounts wisely. Let’s start with branding. Every piece of content you post on your social media should be relevant to your brand. That means no cute cat videos, and no clips from America’s Got Talent. The one exception might be if there’s a local connection. Likewise, make sure you use a consistent tone. Your plumbing brand should have a voice. You will want to sound authoritative and competent. You will probably want to stay away from slang, profanity, and anything that could offend ANYONE. Posting content regularly will help increase your visibility. Pages that appear to be inactive may lose followers. You will want to keep your followers engaged. Ask for clicks or a purchase. Only about a quarter of your CTAs on social media should be this direct. “Click here to book an appointment now” is an example. If you have several accounts, you might want to consider using a scheduling tool to manage them. Every plumber knows builders. But, if you are not pairing up with them to get new leads, you’re missing out. When someone wants to build a new home, they think of hiring builders first. They may ask the builder to recommend a plumber. Or, they may assume that the builder will retain a good plumber on their behalf. Either way, the benefits of partnering with a builder are clear. Build a good relationship, and they will mention your name if someone asks for a plumber. They may hire you as a subcontractor, too. Choose your partners wisely. You will want to make sure that the builder you choose has a solid reputation. Partnering with someone who cuts corners won’t help you. Some builders will already have plumbers they prefer. If that happens, you can still ask for leads. There may be times when their usual plumber is busy. Then, you can step in and show them what you can do. Plumbing is, by nature, a local business. Nobody wants a plumber who lives hours away. Networking in your local community lets people know who you are. The key to networking is visibility. When people are used to seeing you around, they will think of you when they need to hire a plumber. When you do these things, make sure to carry business cards with you. Hand them out, and don’t be afraid to give people a few extras. Suggest that they hand them out. Here are a few extra cards if you know anybody who needs a plumber. Some people might decline to take extra cards. But, many will, and you will get some leads as a result. This is one of my best advertising ideas for a plumbing company. And it is free. One easy way to get leads is to search for forums whose members might need to hire a plumber. Joining most forums is free. Once you are a member, you can participate in the conversation. The key to using this method to generate leads is simple. The first thing you should do is create a signature that will appear on each post you write. It should include the URL of your website. Then, read the posts and look for opportunities to respond. For example, perhaps someone posts a question about how to fix a leaky faucet. You can offer your opinion as a professional. As you offer useful advice, you will become a valued member of the forum. People will remember that you are a plumber. And, people who live in your area may contact you to do plumbing work in their homes. They may also refer you to friends. Video marketing is growing in popularity. That is because videos are inexpensive to produce, heck all you need is decent lighting and iPhone. They are also easy for people to share. Most people say they would rather watch a demo or explainer video than read a blog post. Creating one useful video can bring in dozens of leads. For plumbing businesses, demo and DIY videos are good formats to try. They are an ideal way to show your expertise. Not everybody can handle DIY plumbing jobs. Those who do will appreciate a demo. They may hire you when a more complicated job needs to be done. The key is choosing a topic that is likely to be a common pain point for your customers. You get the idea. The topics you choose should be ones that homeowners are likely to search. You can post them on YouTube. Since YouTube is owned by Google, there are ranking benefits to this approach. You may even want to dedicate a page on your site to DIY or demo videos. Make sure to include a call to action at the end of each video. Marketing your plumbing company can take your business to the new level. However, it does require a good deal of time and effort to do well. Be selective and pay attention to what works. Not every strategy will be worth pursuing. If you would like to talk to me about how I can help you. Even if you are starting your plumbing business, please click here to make an appointment. Awesome post as a plumbing apprentice I was just doing some research online about starting my own business someday. Thank you for sharing so much advice on the industry. Thanks for the terrific guide, my plumbing business is killing it with a referral strategy. Also like so of your other ideas like the video guides. Thank you for the terrific post Brad. I read every possible post on marketing my plumbing business online and this is one of the best I have come across.